Since its founding in 1987, the success of our company has never stopped growing. Thanks to the competence and expertise of our employees, early Lumatec has directed its development toward miniaturization to develop products with extended functions but compact. Being at the forefront of technology while combining our developments in the functional, technical and aesthetic appearance. Optimize the product performance and offer solutions that fit into the architecture of places without misrepresenting it. 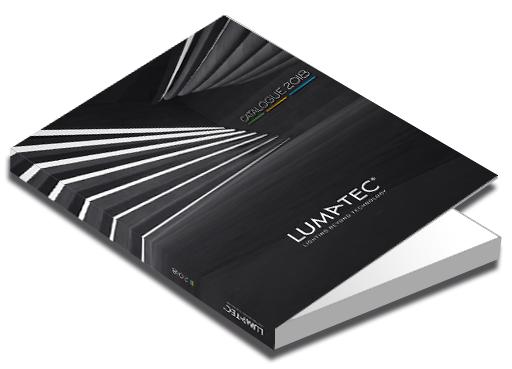 Lumatec designs its products in a process of energy efficiency. Part of a coherent whole constituting a global citizen approach based on the principles of sustainable development. Focused on three strategic axes Lumatec promotes within the group a social policy, a business ethics and an environmental approach. In 2009, our European presence has been strengthened by the merger with the Company Class Market. Specializing in architectural lighting for the French market. Through this acquisition Lumatec strengthens its position in Europe and thereby offers a presence in more than ten countries, supported by about 70 employees. Lumatec is engaged in permanent quality process that involves all the steps of manufacturing process. All our products comply with European standards and our french range is certified NF. Because we don't have waited that the protection of the planet is fashionable to take care of our environment. Lumatec has developed its first emergency lighting, fully equipped with LEDs, more than fifteen years ago. 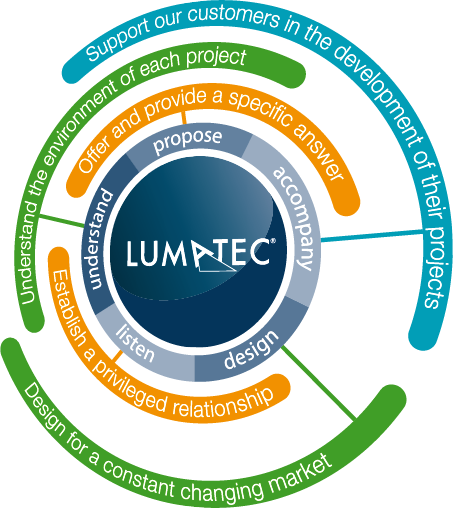 Lumatec is therefore committed very early in eco-design in a natural way. By encouraging the use of new lighting sources, Lumatec has reduced more than 85% of the energy of its own self contained emergency lighting. By promoting the use of recyclable materials to infinity as aluminum or glass, by respecting and applying the Rohs directives, Lumatec reduced the impact of its activities on the planet resources. By promoting the selection of our economic partners in nearby geographic areas of our production sites Lumatec contributes to reducing CO2 emissions. By guaranteeing on products where life cycle exceeds 70,000 hours. In financing the recycling WEEE Lumatec limits its impact on the environment. The Lumatec group also participates in different programs of European eco-contribution. As producer participant in Recylum sector for French program. Lumatec builts its success through the quality and value of its human capital. Each employee has the possibility to express themselves and to constantly evolve within the company, Lumatec promotes the development of its staff and invests in training. Lumatec is committed to apply a principle of ethics and transparency in all its business activities, we ensure that our trading partners are involved in a similar way. Establish, through an active listening, a privileged relationship with our partners to manage all of their needs. Understand the environment of each project to position themselves in line with the original spirit of the project. Capitalize on our knowledge to design with innovative choice of products in the service of constantly changing market. Offer and provide an appropriate and specific answer to your projects. Provide upmarket products, of finish and irreproachable quality. Support our customers in the development and management of their projects and build a lasting relationship based on mutual confidence.